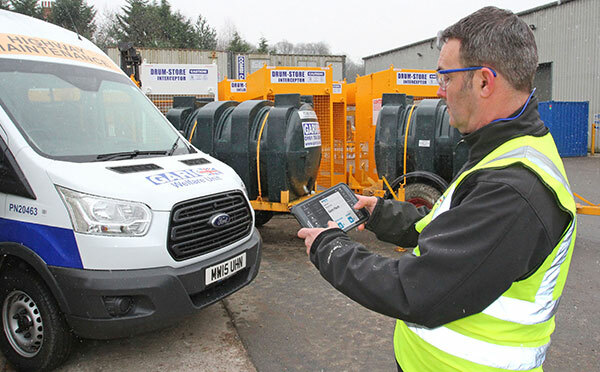 Garic has improved and streamlined their hire and service operations replacing 400 paper worksheets with an all-in-one tablet app that also provides job scheduling, asset management, live tracking and reporting. A large part of Garic’s work involves servicing plant and welfare facilities – for example emptying waste, replenishing water and fuel. Garic recently launched a new remote equipment monitoring system called i-SITE that monitors fluids to alert service operations. Service drivers, who respond to automated service requests and scheduled jobs, are equipped with rugged Samsung tablets and are amongst the primary users of the 90 BigChange-connected devices currently in use. With service operations previously managed at three regional depots, the company has been able to centralise the management of service operations with the BigChange mobile solution integrated with the inspHire hire management system. With their headquarters near Bury, Garic has depots in Bedford, Dudley and Bathgate, with plans for a fifth site in Thurrock this year. BigChange offers a cloud-based solution that requires no onsite software and is fully supported, eliminating the need for specialist IT support. Easy to use and configure, BigChange is unique as it is a truly multi-functional solution that handles tasks that are traditionally spread across a number of different systems. At Garic, BigChange is used for everything from worksheets, routing and job scheduling, to vehicle safety checks and driver performance assessment.